To the brass beats of the Prince Edward School Jazz Band, on Feb. 6, a crowd of approximately 150 government officials, health professionals, and members of the press celebrated the launch of three programs in Zimbabwe, two of which are implemented by I-TECH Zimbabwe and partners. These vital programs aim to build local capacity and provide comprehensive services to prevent and combat HIV/AIDS in the country. Speaking at the festivities were David Bruce Wharton, U.S. Ambassador to the Republic of Zimbabwe; Dr. Owen Mugurungi, director of the AIDS and TB Unit at the Ministry of Health and Child Care (MOHCC); Dr. King Holmes, Chair of the Department of Global Health at the University of Washington; Dr. Ann Downer, Executive Director of the International Training and Education Center for Health (I-TECH); and Dr. Batsirai Makunike-Chikwinya, Country Director of I-TECH Zimbabwe. 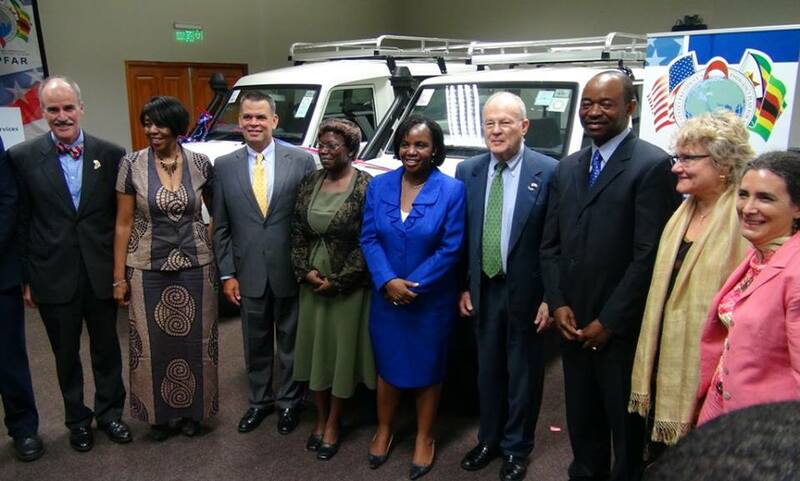 In this spirit of collaboration, the programs, totaling $65 million over five years, support the Zimbabwe MOHCC with grant funding by the U.S. President’s Emergency Plan for AIDS Relief (PEPFAR), technical support from the Centers for Disease Control and Prevention, and implementation by local and U.S.-based partners. These partners include I-TECH; Zimbabwe Association of Church-Related Hospitals; Zimbabwe Community Health Intervention Research Project; Compre Health Services; The Newlands Clinic and Newlands Clinic Training Centre; Pangaea Global AIDS Foundation, Zimbabwe; and the University of Zimbabwe-University of California, San Francisco Collaborative Research Programme. The Training and Mentoring Program seeks to develop and deliver in-service training on antiretroviral therapy, including the medical management of HIV/AIDS, women’s reproductive health, tuberculosis (TB), and TB/HIV co-infection to 8,000 health care workers across the country over five years. A mentorship component will also provide health care workers with access to ongoing learning and feedback on clinical issues. Health workers will receive refresher trainings via distance learning technologies, and the effectiveness of the program will be measured through a training database. Also celebrated – and accompanied by a ribbon-cutting and presentation of 17 new vehicles – was the launch of the Voluntary Medical Male Circumcision Program. The program, building on work that started last spring, seeks to deliver services to 412,000 men in Zimbabwe between the ages of 15 and 49 years over the next five years. Medical male circumcision has proved very effective in preventing the spread of HIV. Randomized controlled trials in Uganda, Kenya, and South Africa have shown that this intervention reduces the risk of female-to-male sexual transmission of HIV by approximately 60%. “Together, these two programs will improve the effectiveness and quality of prevention, treatment, and care services for those affected by HIV/AIDS – and create better health systems for all Zimbabweans,” said Dr. Holmes.